The pattern consists of a traditionally styled round necked dress which is long sleeved in design and button fastening to the back bodice. 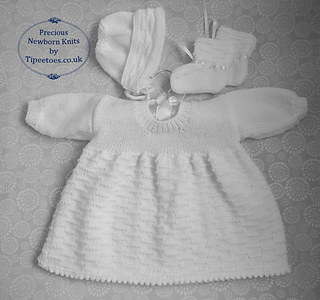 Very easy to knit using simple knit and purl stitches throughout the dress features a pretty picot hem line. The matching bonnet features a lovely turn back brim with the garter stitch detailing picked out to match the skirt of the dress. Booties are knitted to match with garter stitch detailing used on the cuffs. Instructions are also given to knit a matching headband. The completed outfit is sized to fit a baby girl 3-6 Months with the dress having a finished chest measurement of 20in. 3 Buttons and a small piece of inch wide elastic for the headband plus purchased ribbon roses if required.